One file in the Archives reveals information about the Youngold. You read carefully to learn about this creature and obtain more knowledge about the mysterious species of Ark. The brilliant shimmer of a single sunstruck Youngold egg is oftentimes enough to outshine, quite literally, a Dragold's own treasure trove, a characteristic that stirs immense envy in the latter species. As might be expected, avaricious Dragolds will hoard these eggs for their own selfish intentions. Youngolds are piscivores that prey upon the assorted species of fish found within Ark River. 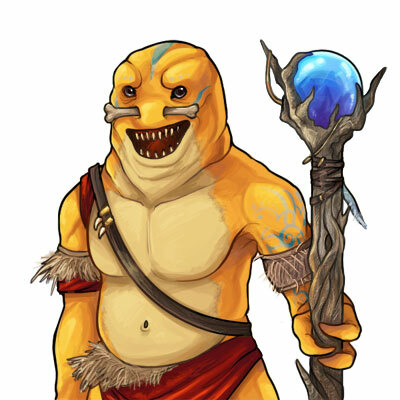 Koins, fish that collect valuables hidden amid the riverbed, are commonly targeted by Youngolds for both their flesh and treasure. Presumed to have been originally discovered alongside the Dragold, it was not until much later that the Youngold would be officially recognized as its own species. Their diminutive stature and uncanny resemblance had misled early researchers into inferring them as the Dragold's juvenile form. In truth, Youngolds keep a dwarfish, youthful appearance throughout their entirety and the Science and Research Center has since ascertained them as genetically distinct. A Youngold that hatches from one of the countless eggs in a Dragold's stash will imprint on the Dragold as a parental figure. Using this misguided trust to their advantage, Dragolds will command Youngolds to collect valuable objects to bring back to the den.